2 “SPYRAL” monsters This card’s name becomes “SPYRAL Super Agent” while on the field or in the GY. You can declare 1 card type (Monster, Spell, or Trap); reveal the top card of your opponent’s Deck, and if you do, and its type matches the declared type, take 1 “SPYRAL” monster from your Deck or GY, and either add it to your hand or Special Summon it to your zone this card points to. You can only use this effect of “SPYRAL Double Helix” once per turn. SPYRAL Double Helix, the card that helped launch the Age of SPYRALS. Without this monster, the deck wasn’t going to be as good, they needed this, and they got it. It isn’t the most important card in the archetype, but it is needed. Only able to be played in SPYRALS, it becomes Super Agent on the field and in the grave, gaining the perks of being Super Agent. Call the top card on your opponents deck, get it right and get a free search or search and Special Summon. Drone and Tough can help rearrange your opponents deck to make certain you’ll call it right with any “Super Agent”. Only once per turn, and low ATK can’t hold this card back from being central to the archetype. With the Special Summon after the search, Double Helix can do so many things. Last Resort will protect DH from everything, and gives it the ability to attack directly, Master Plan will search out a SPYRAL MISSION card for you to further your turn, and Quik-Fix will get another search. Great card for the archetype, helped make the deck a dominating force that needed addressing in the ban list. SPYRAL Double Helix is a Link-2 Earth Warrior-type Link Monster with 1900 Atk and Left and Bottom Arrows. 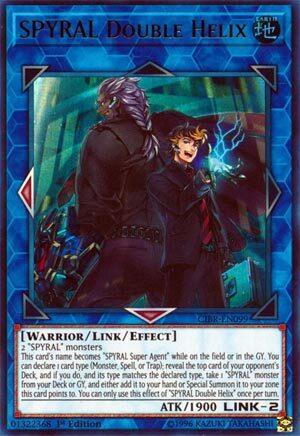 It’s name becomes SPYRAL Super Agent on the field or in the grave, which grants it a lot of synergy with the other SPYRAL cards. It also gains Super Agent’s effect to search after a successful prediction of the opponent’s next card. They require two SPYRAL monsters to Link Summon, and the attack is a bit low, but this card really brings in combo pieces consistently. Obviously, there is no usability in other decks, but Double Helix really brought SPYRAL to the front of the tier list. Super Agent in disguise indeed. The number 7 card is a card I mistakenly didn’t add to my list in favor of cards in the True Draco and Zoodiac archetypes, but thinking about it now this card should of got the spot on my list over something like Astrograph Sorcerer, and that is SPYRAL Double Helix. Had this at #4 on his Top 10 List.